EAST GARDEN CITY, Long Island (WABC) -- A teenager is accused of robbing a jewelry store on Long Island and threatening mall security with a taser. 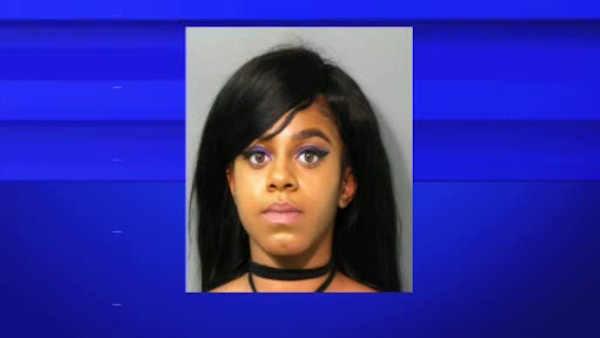 Nassau County Police say 18-year-old Imani Merchant stole a pair of earrings from a Claire's in Roosevelt Field Mall in East Garden City Saturday afternoon. She allegedly concealed the earrings in her pocketbook before exiting the store without paying. Security stopped Merchant as she was attempting to exit the mall at which time the suspect displayed a Taser at the victim and threatened her, according to police. Merchant fled the mall and was stopped in the parking lot by Nassau County Police mounted officers who were able to place her under arrest without incident. Police say Merchant was in possession of an Oxycodone pill at the time of her arrest. She is charged with robbery, criminal possession of a weapon and criminal possession of a controlled substance.